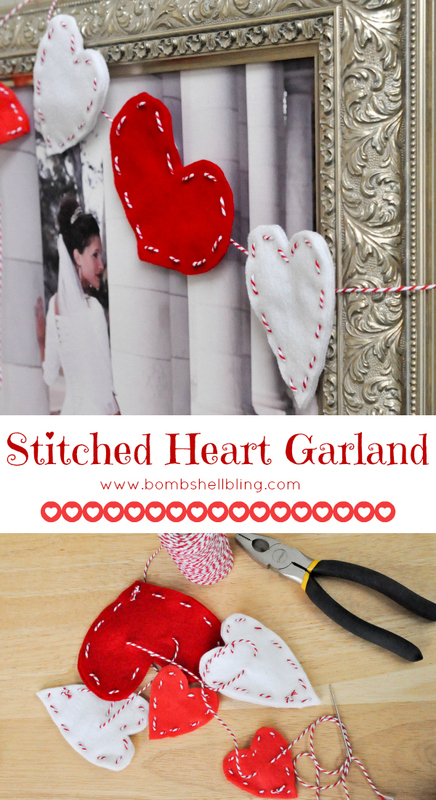 Stitched Heart Garland - Perfect for Valentine's Day! 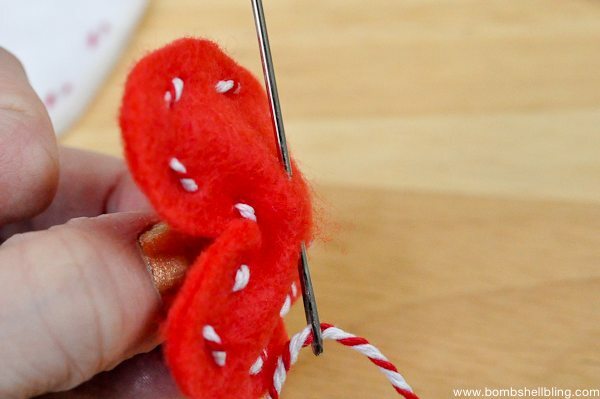 Make a simple and sweet handmade felt stitched heart garland using this tutorial. It is a perfect Valentine’s Day decoration! 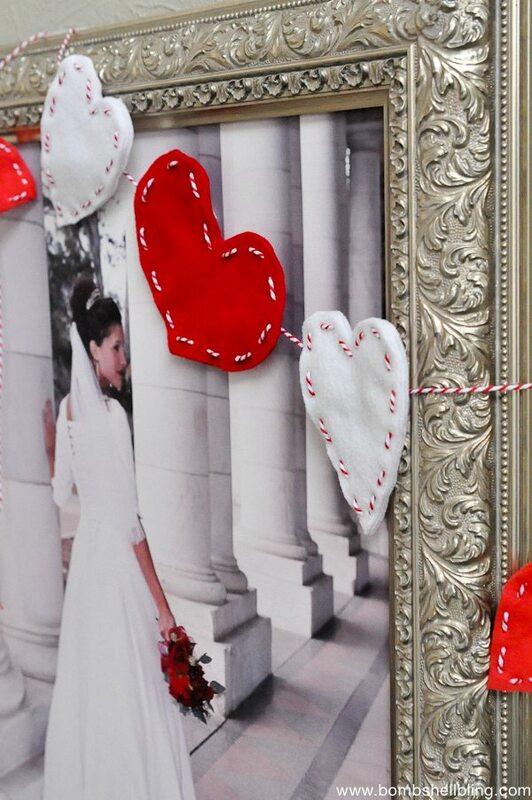 Today I am going to share with you a sweet and simple stitched heart garland that I made last month. 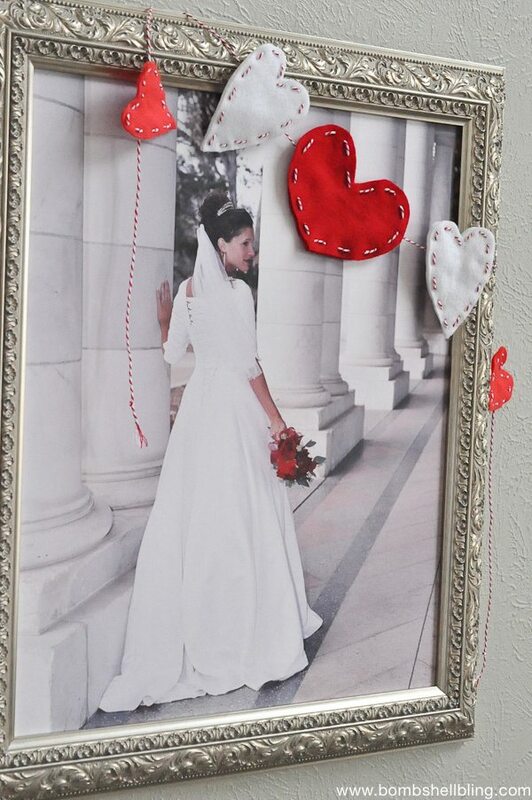 This project was inspired by the Easy Felt Hearts & Garland project from Sweet C’s Designs that I pinned to my Valentine’s Day Pin board last week. (Don’t worry – I got her blessing to recreate it!) I knew this project would come together quickly and be a perfect little decoration for my home. The biggest difference between my stitched heart garland and the original is that I decided to use baker’s twine instead of embroidery thread. It did make it a bit harder to complete, but I LOVE how it turned out! Well, are you ready to take on a simple project? Then let’s do this thing! Start by cutting out your hearts. 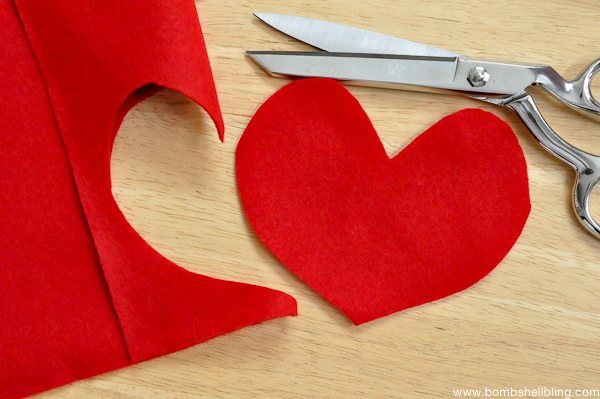 YOU WILL NEED TWO CUT OUT HEARTS FOR EVERY ONE HEART ON THE GARLAND. Did that make sense? I hope so. Basically, each heart is double layered. If you want perfect heart shapes then you may want to print out a heart from the computer or use a die-cutting machine to make a stencil. I just went elementary school style and folded my felt in half and cut out a heart. Then I used that heart as the stencil for my second layer. Place the two layers on top of one another, thread the baker’s twine through the yarn needle, and start stitching. Here is where the pliers came into play. I couldn’t yank the baker’s twine through on my own because it was so thick, but the pliers did the trick. I used them for each stitch. Increased the time, but I love the look of the baker’s twine instead of the thin, solid colored embroidery thread. Be sure to tie off the baker’s twine on the back of the heart. 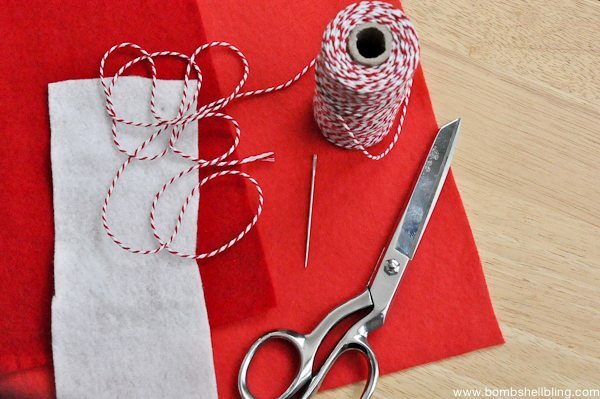 Repeat this process with each stitched heart that you plan to use on your garland. Next, pull the two pieces apart gently and stitch THROUGH THE BACK LAYER ONLY. Repeat this to thread all of the hearts onto one long piece of baker’s twine. Cut the baker’s twine and tie a small knot close to the end of the twine. I hope that you are feeling inspired to go CREATE! I would love it if you followed along with me on Pinterest, Instagram, and Facebook for more fun inspiration! Below are a few of my favorite Valentine’s Day posts from my own site. Have a lovely day! (This is a tradition that my mom made up more than 20 years ago, long before the era of Pinterest. Really sweet, thanks for sharing on craft schooling sunday and great to see you back at the party in 2016! This is so cute! Thank you for linking up at The Wednesday Round Up with us and we hope to see you back next week! Thanks for sharing at #HomeMattersParty! Great craft. Thanks for sharing with us at Throwback Thursday. Can’t wait to see what you bring this week!Thanks for sharing with us at Throwback Thursday. Can’t wait to see what you bring this week! Secret Cupids! Of course! Why didn’t I ever think of that?? Perfect for the day of love! 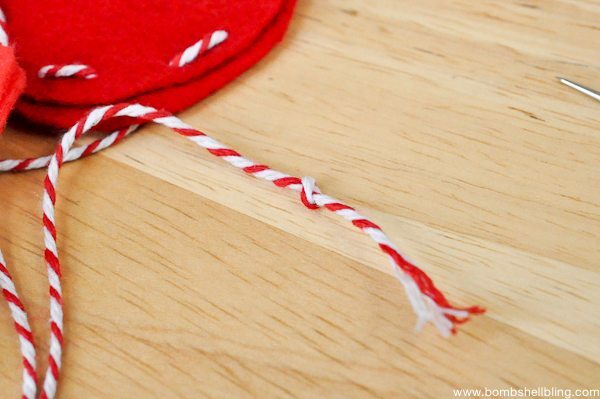 And the striped twine on the hearts is just too cute. Thanks for bringing this by Throwback Thursday! 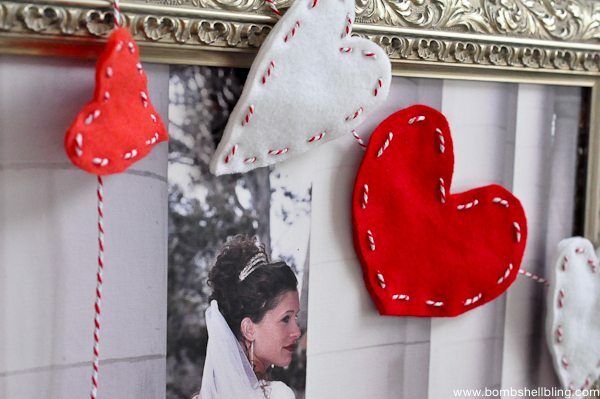 I love felt projects and these hearts are no exception. Pinned & shared. Thanks for joining in at to share at the Inspiration Spotlight party. See you again soon! 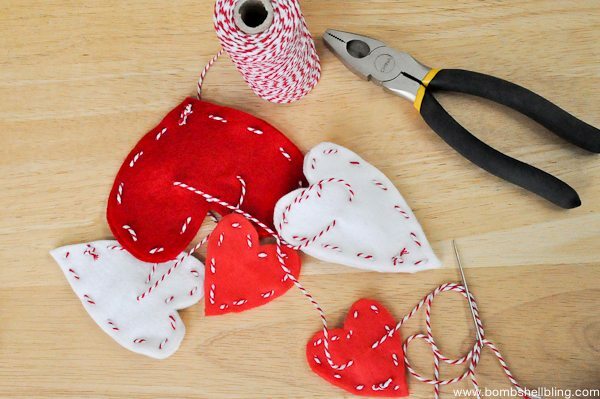 Your stitched heart garland is adorable. Thank you for sharing a Snickerdoodle. I am featuring it at the party tomorrow. 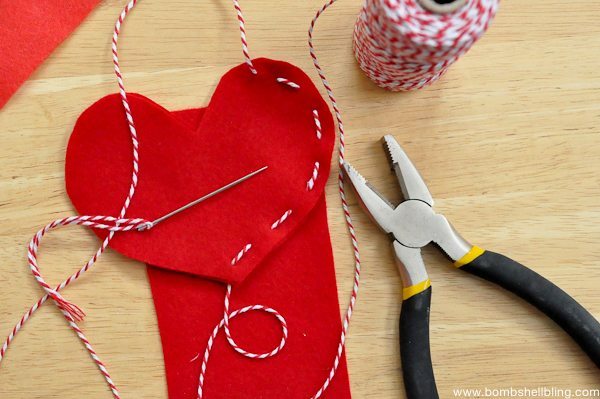 This is such a sweet Valentines Day Project! Love how you have used the butcher’s twin to join the hearts together!! Thank you so much for sharing your fun project with us over at Waste Not Wednesday! This is the cutest garland, looks so easy to make, IM heading to Michaels for supplies. These remind me the puffy hearts I made from a flannel shirt. This garland is absolutely adorable and my favorite from the Waste Not Wednesday link party. Thanks for sharing it with us at the Waste Not Wednesday link party. Can’t wait to see what you are up to this week. This garland is really cute! I like the contrast of the stitched baker’s twine. Thanks for sharing at Merry Monday!